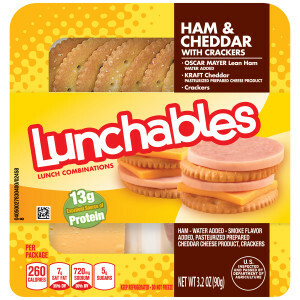 Lunchables Convenience Meals - Ham and Cheddar, 3.2 oz. From kids' lunches to your micro market, LUNCHABLES is a fan favorite. Offer customers the convenience of this on-the-go meal for all ages! 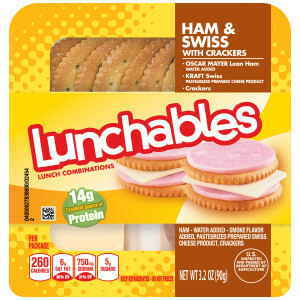 Lunchables Convenience Meals - Ham and Swiss, 3.2 oz. 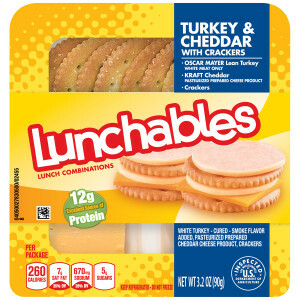 Lunchables Convenience Meals - Turkey and Cheddar 3.2 oz. 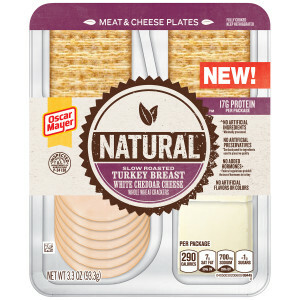 Oscar Mayer Natural Meals - Roasted Turkey, Cheddar & Crackers, 3.3 oz. OSCAR MAYER Natural Slow Roasted Turkey Breast is made with our cleanest ingredients, no artificial preservatives, no added nitrates or nitrates, and nothing artificial, so nothing gets in the way of great taste! 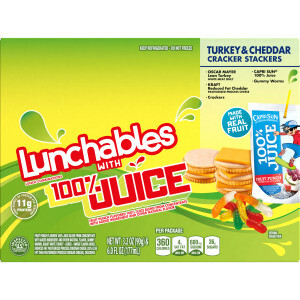 Lunchables Convenience Meals - Turkey and Cheddar 9.2 oz.